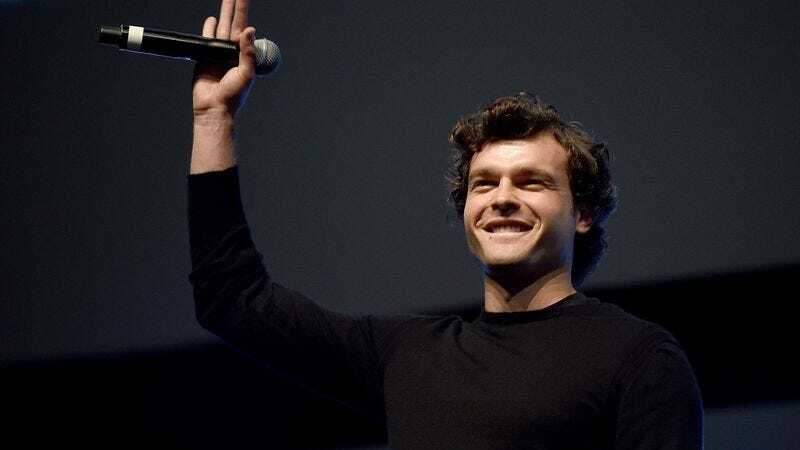 Star Wars Celebration is still going on over in Europe, and though there haven’t been any more big reveals on par with Grand Admiral Thrawn joining Star Wars: Rebels or all of those big Rogue One announcements, today’s panel did give newly hired Han Solo actor Alden Ehrenreich a chance to enjoy a little excitement before his every step is mercilessly judged by the internet. Just look at him up there. He seems so full of hope that it’s almost like he hasn’t been given the thankless job of living up to one of the most iconic genre performances of all time. Has he seen Star Wars? Does he know that it’s a big deal? Maybe he’s in denial about just how terrifying his future will be? Or maybe he’s screaming on the inside? However he feels, Ehrenreich made his big debut today on a panel that also included Episode VIII director Rian Johnson, Lucasfilm president Kathleen Kennedy, and Phil Lord and Chris Miller, who will be directing the Han Solo movie that Ehrenreich is starring in. Regarding that project, Lord said (according to Variety) that he can “sort of relate” to Han Solo, describing him as someone who “doesn’t want to do anything he is told,” and a “grouchy, cynical guy with the biggest heart in the galaxy.” They didn’t offer any concrete details about the movie itself, but apparently Ehrenreich was the first person who Lord and Miller saw for the part, and after seeing 3,000 other young dudes audition, they went back and gave it to him. On the more fun/less important side of things, The Hollywood Reporter says that there have been some cameo shenanigans going on behind the scenes of all the new Star Wars movies. Apparently, Rian Johnson will have a cameo in Rogue One as a Death Star operator, and both Lord and Miller were supposed to appear as well but had to duck out at the last minute. They’ll make up for it when Episode VIII hits, though, as they both have cameos in that one alongside Rogue One director Gareth Edwards. Unfortunately for J.J. Abrams, it sounds like he’s being left out of all of this fun.